The GAZ-AAA (4M) (4M gun mount on a GAZ-AAA truck), or as the 4M GAZ-AAA, is a Rank I Soviet self-propelled anti-aircraft vehicle with a battle rating of 1.0 (AB/RB/SB). It was introduced in Update 1.49 "Weapons of Victory". The first of the Soviet SPAAs, it presented a crude set-up of bolting a 4M quadruple Maxim MG mount to a 6x4 GAZ-AAA truck chassis. 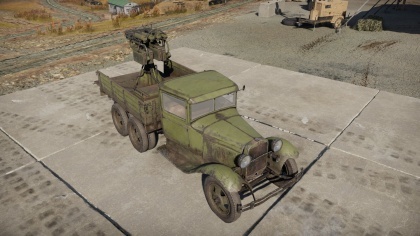 This Soviet improvisation would lead to the Soviet SPAA trend of attaching anti-aircraft weaponry to trucks, half-tracks, and cars in the game. Better suited for hauling potatoes on the Russian steppes than rolling into the battlefield, the GAZ chassis of this vehicle has non-existent armour and is armed with surplus WWI-era machine guns. Besides not being suited for the rigors of ground combat (due to lack of armour), it cannot penetrate even the lightest of armour, so charging into battle is very unadvised (unless the aim is for attracting attention). 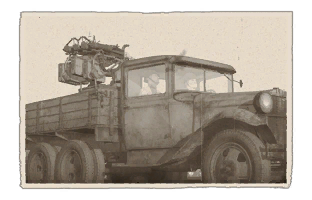 Its quad 7.62 Maxim machine guns are well suited for the vehicle's job as mobile AA, most aircraft at its rank are easily swatted out of the sky by it's high fire-rate and the massive amount of rounds it puts out, even without any particularly skillful aiming. The 4000 rounds of rifle calibre rounds means there is little haste in aiming, so be quite generous in dishing out those rounds. Road wheels are 2 mm thick while the chassis was 5 mm thick. Ammo rack of 4M GAZ-AAA. Stay back from the front lines and destroy incoming aircraft. If a tank comes up to you, don't try to fight as the tanks were built to be resistant to the rifle calibre rounds the Maxim fires. Withdraw to safety if encountering any ground vehicles. The 4M GAZ-AAA is highly vulnerable to any vehicle, from tanks to planes. An encounter will most likely end with the GAZ-AAA destroyed. Prioritize enemy aircraft, as you are significantly vulnerable to strafing and bombing due to the lack of armour. Decent anti-aircraft capabilities afforded by the armament, can do satisfactory damage to aircraft of its rank. Turns in a tight radius like a conventional truck. Large amount of "ready" ammunition, 4000 rounds. Able to reasonably damage lightly armoured vehicles of its kind such as M13 MGMC or M3 GMC. More of a threat to small, nimble aircraft than the M13 or T17E2. 6x4 truck design is sturdier and heavier than 4x2 design of the GAZ-MM (72-K). Has a great rate of fire thanks to the four fast firing maxim guns. Aircraft at early ranks are very common, meaning there will be plenty of aircraft for to be picked off. Good at setting aircraft on fire. Unique ability to fire tracer-less rounds. This allows you to pick off enemy planes without them even realizing that they are being shot at. The fact that you cannot kill tanks will mean that you focus on enemy aircraft rather than stray and hunt tanks. Non-existent armour/protection, anything will penetrate and damage the vehicle. An average car has the same amount of protection as this vehicle, like a VW Beetle. Very light weight, prone to being destroyed by ramming or being overturned by other vehicles. Crew is not afforded much protection, owning to the improvised design. No reserve ammunition, you will only get 4,000 rounds. Low speed of 27 MPH (43 km/h), even slower cross-country. Gunner is exposed to all the sundry, and can easily be knocked out from a stray bullet. Cannot be used effectively against anything other than trucks or aircraft due to its machine gun armament. Outclassed by other AA vehicles in the same rank. Vulnerable to strafing by enemy aircraft, especially to kamikaze attacks. Can easily be tipped over in tight turns. 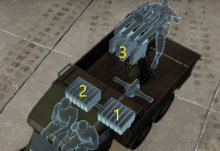 Machine guns are useless against armoured targets except for other GAZ trucks. Around the late 1920s, the Soviet Union was undergoing a mechanization revolution and realized that no purpose-built motor vehicles were available for them to help move cargo and materiel back and forth from point one to point two. The result was the GAZ-AAA truck, which was a truck based off the Ford Model AAA 6x4 truck. These trucks entered production in 1932, and were used in multiple roles in the civilian world and in the military. In the military, the GAZ trucks were used as tractors for gun systems, fuel tankers, radio system, and even armoured cars. By 1931, an anti-aircraft version was created as well, in order to give the Soviet Union a mobile anti-aircraft system to work with. The design had four Maxim Model 1910/30 machine guns installed on a mount on the truck. This configuration was called the 4M GAZ-AAA and served as a low-altitude air defense system after being adopted in 1931. The 4M GAZ-AAA was a crude weapon. It was simply a truck with a gun mount on the back that connected to four 7.62 mm machine guns. These machine guns could all be simultaneously fired by one operator. The operator had no protection whatsoever as he had to stand in order to fire the gun, there were also no gun shields to protect him from any incoming fire. Despite that, it served as a part of the Soviet defense against the German invasion in 1941, where it was also used in an infantry-support role by laying down a large volume of fire onto the enemy. Many were seen destroyed in German news reels, covering the roads as German troops advanced deeper into the Soviet Union. The vehicle was unsatisfactory for the battlefield, and even ineffective against planes due to its low caliber. A new anti-aircraft system had to be devised for the role of mobile anti-aircraft system. This led to the development of the GAZ-MM (72-K), which while still a truck-mounted weaponry, had a noticeable increase in firepower with a 25 mm auto-cannon. This page was last edited on 17 March 2019, at 03:45.